If you’ve got a bad tattoo that needs to be gone from your skin always and forever, you’re in good company. As the number of people getting tattooed increases all the time, so does the number of people who want to get rid of their Tinkerbell/Tasmanian Devil/ex-boyfriend’s name. Fortunately for the tattoo-haters of the world, there’s no need for painful dermabrasion or chemical treatments to get rid of your ink. Even the former gold standard, the Q-switch laser, is now about as exciting as yesterday’s newspapers; PicoSure is the new kid on the block and it’s fast becoming the only way to go. Taking the PicoSure option has many benefits over laser removal; you’ll need fewer treatments, for starters, which means that removing the dolphin jumping over your ankle bone has never been quicker, easier or more affordable. 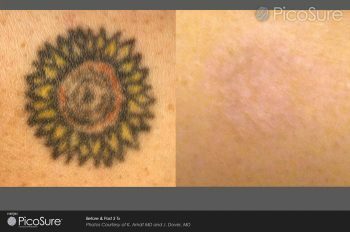 Q-switch lasers use laser light to break down the ink particles in your tattoo – too big to be reabsorbed by the body – into small enough fragments for the body to get rid of them naturally. This process relies primarily on photothermal (that’s a fancy word for heat) energy that works to break down the tattoo. Unfortunately it also works on the surrounding skin; doesn’t sound too pleasant, does it? PicoSure, on the other hand, creates an intense, super-short photomechanical pulse that essentially obliterates the ink into teeny-tiny particles that are absorbed by the body even faster than the lasered ones. That’s why it’s so much more effective! PicoSure tattoo removal is also much more effective at removing blues and greens, and can even wave goodbye to tattoos that have stopped responding to other, older lasers. So what are you waiting for? Get booking! To find out more information about the PicoSure laser, please visit this page.